I know we aren’t leaving for some time yet but that doesn’t mean I can’t begin “prepping” for the trip! I bought these “boots” last summer — when we were in Nanaimo. They ain’t pretty but they’re made for walking! They also feel like a second skin while wearing them. 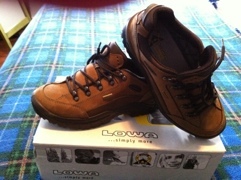 Lowa makes great footwear. If you have to do a lot of walking, you want these bad boys! Yup!